Rachael Denhollander’s courage was on display for all of us to see. Over the last week I have experienced anger, frustration, numbness, grief and sadness as I watched more than 150 survivors of sexual abuse courageously face Larry Nassar in the courtroom and deliver victim impact statements. The final victim testimony came from Rachael Denhollander. Denhollander was the first survivor to file a police report against Larry Nassar. It’s quite fitting that the woman who first brought this man’s evil actions into the light by filing a police report would be the last to face him in the courtroom. 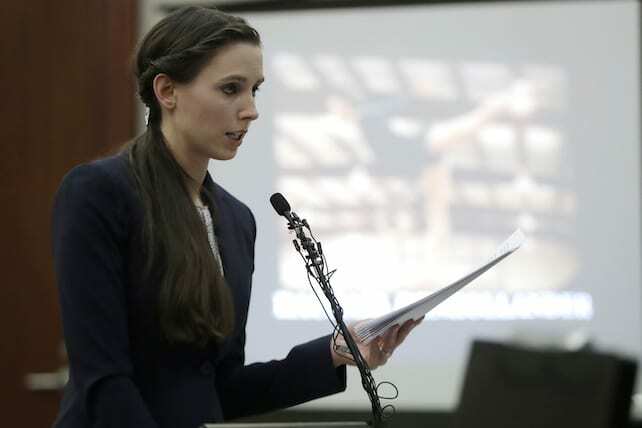 Her testimony stood out from the other 163 because what she said directly to Larry Nassar was such a profound response to the trauma she endured from him. Her victim impact statement is a testimony to the grace, power, forgiveness and justice only available through the gospel of Jesus Christ. I want you to understand why I made this choice, knowing full well what it was going to cost to get here, and with very little hope of ever succeeding. I did it because it was right. No matter the cost. It was right. And the farthest I can run from what you have become is to daily choose what is right, instead of what I want. You have become a man ruled by selfish and perverted desires. A man defined by his daily choices over and over again to feed that selfishness and perversion. You chose to pursue your wickedness no matter what it cost others. And the opposite of what you have done is for me to choose to love sacrificially. No matter what it costs me. If you have read the Bible you carry, you know that the definition of sacrificial love portrayed is of God himself loving so sacrificially that He gave up everything to pay a penalty for the sin he did not commit. By His grace I too choose to love this way. You spoke of praying for forgiveness, but Larry if you have read the Bible you carry, you know forgiveness does not come from doing good things, as if good deeds can erase what you have done. It comes from repentance. Which requires facing and acknowledging the truth about what you have done in all of its utter depravity and horror, without mitigation, without excuse, without acting as if good deeds can erase what you have seen in this courtroom today. The Bible you carry says it is better for a millstone to be thrown around your neck, and you thrown into a lake, then for you to make even one child stumble. And you have damaged hundreds. The Bible you speak of carries a final judgment where all of God’s wrath and his eternal terror is poured out on men like you. Should you ever reach the point of truly facing what you have done, the guilt will be crushing. And that is what makes the gospel of Christ so sweet, because it extends grace, and hope, and mercy where none should be found. And it will be there for you. I pray you experience the soul-crushing weight of guilt so that you may someday experience true repentance and true forgiveness from God, which you need far more than forgiveness from me—though I extend that to you as well.